We may know the Waikawa River from what we see of it at the footbridge, but around 6 Km upstream our Waikawa River is formed from two other streams: the Waikawa and the Manakau. 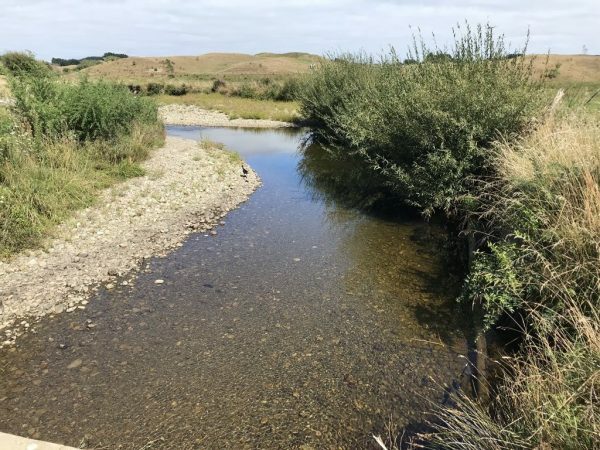 The two streams converge about 100 metres west of Whakahoro Road. That’s the shingle road with all the letterboxes that runs north, opposite 363 Waikawa Beach Road. North at the top. 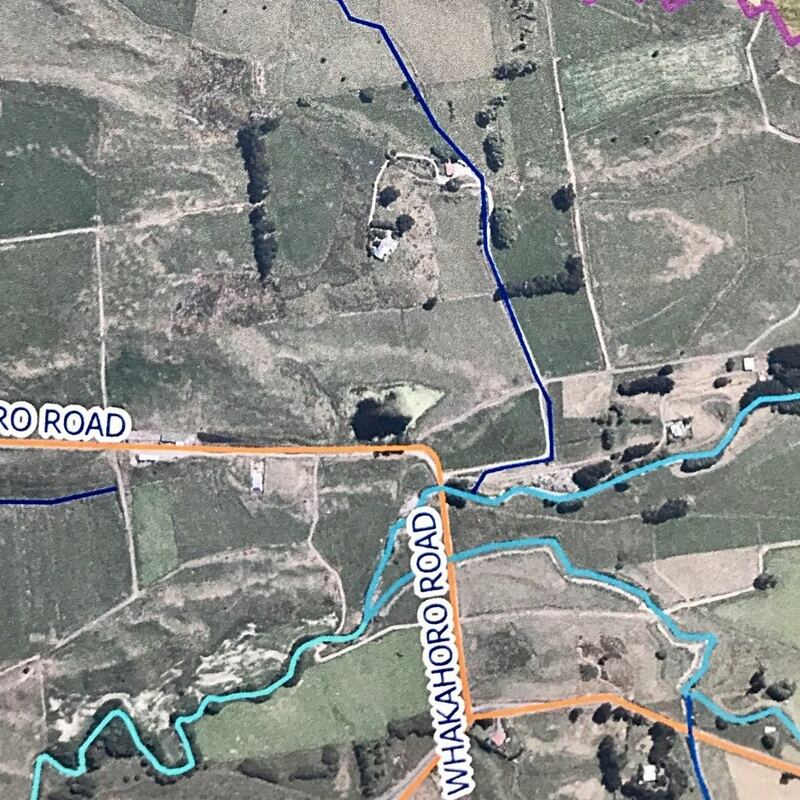 The Waikawa Stream (north) and Manakau Stream (south) join just west of Whakahoro Road which runs off Waikawa Beach Road, the orange line across the bottom of the map. The Manakau Stream comes down from the hills above South Manakau Road and Waitohu Valley Road. It runs behind Quarter Acre Cafe and Waikawa Blueberries before it crosses Takapu Road, then Waikawa Beach Road, and finally Whakahoro Road. Aside: it’s a bit confusing that there’s a different Whakahoro Road nearby — it runs west off State Highway 1 just north of the Ngati Wehiwehi Marae. Drive about 200 metres along Whakahoro Road and you’ll cross what looks like a filthy ditch. That’s the Manakau Stream. At Whakahoro Road, Manakau Stream looks muddy and dirty. The Waikawa Stream comes down from above North Manakau Road and is sourced deeper in the hills. It runs through the Waikawa Reserve then roughly parallel to Waikawa Beach Road but about 1.5 Km further north as far as Whakahoro Road, mentioned above. Drive a further 90 metres along Whakahoro Road and look down to see the crystal clear waters of Waikawa stream before it joins Manakau Stream. At Whakahoro Road, Waikawa Stream looks clean and clear. It’s quite a shock to see the difference between the two streams. Maybe if the Manakau Stream didn’t join in then the water by the footbridge would also be crystal clear. I suspect the paddocks of corn, with the consquent absence of cows, have had a big impact on the cleanliness of the water this year. Last year too Horizons Regional Council spent several weeks clearing a channel further upstream. I noticed the first thing the new owner of that block by the village entrance did was to fence off the waterways. Enter your email address to subscribe to this website and receive notifications of new items by email. Check the latest info on the water quality at the footbridge. Monitoring began on 12 November 2018 and will finish at the end of April 2019. They are also monitoring toxic algae. Click the picture below for a larger version. 21 April 2019: RED (813.0 MPN/100mL). Since 12 November 2018: 13 green, 6 orange, 5 red. Check out our public noticeboard! What attracted me to this area was the peace and serenity, no shops or other commercial activity and the lack of traffic which made the area safe for my family and grandchildren to walk or ride on bikes around the settlement. Admin on Waikawa Beach erosion protection or a buffer zone as in Paekakariki? Scott Ford on Waikawa Beach erosion protection or a buffer zone as in Paekakariki? That fabulous header image above? It was created by Rodney Inteman, owner of InterVille. Kāpiti Island was cloaked in mist, but a gull was relaxing on the beach. Fishing vessel 63018 Clam Legend was working very close to shore near the river mouth again today. Water quality at the footbridge. 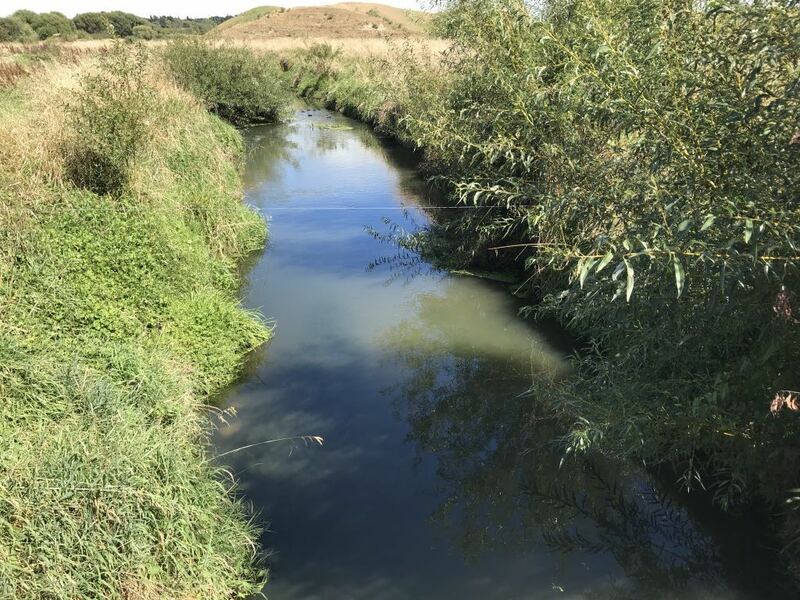 Monitoring began on 12 November 2018 and will finish at the end of April 2019. Latest E. Coli water quality reading at Waikawa Beach Footbridge — 21 April 2019: RED (813.0 MPN/100mL). Since 12 November 2018: 13 green, 6 orange, 5 red.